I got a big bunch of cilantro from my local food co-op this week and have been using it liberally in my salads, omelets, and of course smoothies. 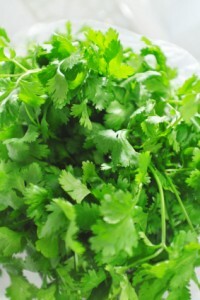 A small green leafy herb that’s often used to garnish, don’t take cilantro lightly, it packs a hefty nutritional punch. In this day and age where we find ourselves bombarded by toxins from every direction it’s important to get enough detoxification agents into our diet. Cilantro is best known for its ability to detoxify heavy metals, in particular mercury from the body. Studies have shown that consuming large amounts of cilantro daily can actually mobilize mercury and other toxic metals from the central nervous system, which is why cilantro is often used with other herbs and supplements in chelation (removing heavy metals from the body) therapy. Besides aiding the body’s detox efforts, cilantro is also rich in vitamins and minerals such as magnesium, potassium, calcium, manganese, iron, and vitamins A, C, and K. Some of the health benefits associated with cilantro include easing inflammation, reducing free radical damage (antioxidant), improving cholesterol profile, helping with menstruation related issues, and easing digestive related issues like stomach gas, nausea, and diarrhea. For more info on the health benefits of cilantro, click here. If you don’t like the taste of cilantro, don’t fret, it’s masked pretty well by the sweet fruit in this recipe. Now for this delicious mouthwatering tropical treat. If you try this tropical cilantro smoothie please leave a comment below and tell me all about it. Happy Blending! This is surprisingly refreshing. Instead of water I used mango tea and put a cup of ice in as well. Very good smoothie recipe. Mango tea, never had it before, but I’m sure it’s delicious. Thanks for sharing your tweak to this recipe and I’m glad you enjoyed it. Cheers! I love this smoothie. It is very refreshing. The kids love it, too. I use frozen fruit, which I think makes it nice and cold. If I would use fresh fruit, I probably would add ice cubes. Always a good sign when the kids like it :) I’m with you on the frozen fruit – whenever I have a choice it’s always frozen over fresh for me. To those who like the taste of cilantro, this smoothie may be delicious, but to those of us averse to cilantro, no amount of ANYTHING will mask it–especially not a half cup of it. I wish I knew what other people were tasting, because this smoothie sounds incredibly healthy, but my tongue tries to hide at the mere mention of cilantro. Don’t suppose there’s anything you could substitute for it? Sorry to hear about you and your tongues aversion to cilantro :) There are my greens you can substitute with. Spinach, kale, lettuce, dandelion greens, arugula, and beet greens are all viable replacements. It has been proposed that dislike to cilantro my be a genetic factor. You may find this article in the New York Times interesting. This is a quite tasty smoothie. I kept it basic with the cilantro, pineapple and lime juice. I didn’t have any mango handy, but used a touch of natural honey and crushed ice in place of the water. Next time I may add in a bit if cucumber and/or fresh mint.